In 1976, Willy Brandt is elected President of the Socialist International at the head of which he becomes an advocate for peace, democracy and human rights worldwide. Moreover, from 1977 on, he leads the North-South Commission which, with its “Brandt Report,” makes new proposals for global development policies to overcome hunger and poverty. 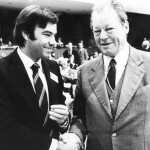 In 1979, as his party’s top candidate, Brandt also joins the European Parliament which is directly elected for the first time. 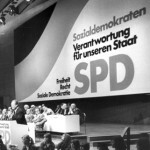 Despite growing differences with Chancellor Schmidt, the SPD chairman supports the social-liberal coalition in Bonn until its collapse in 1982. With the murder of the President of Berlin’s Court of Justice, Günter von Drenkmann, on 10 November 1974 and the kidnapping of the Berlin CDU politician, Peter Lorenz, on 27 February 1975, extreme leftist terrorism in the Federal Republic reaches a new level. During the night of 5 March 1975, Lorenz is set free. To save his life, the federal government headed by Helmut Schmidt (SPD) has met the demands of the hostage takers and allowed five terrorists of the “2nd June Movement” and the “Red Army Faction” (RAF) to fly to South Yemen. In a heated Bundestag debate on 13 March 1975, the SPD chairman, Willy Brandt, stands by this decision. In his speech, he warns against demagoguery in the struggle against terror. As Brandt insists, only legal means can be employed against violence. 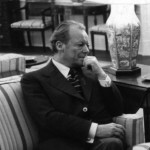 Mexico is the first stop on an eleven-day trip to Latin and North America, which Willy Brandt begins on 21 March 1975. His discussions with President Luis Echevería, centre mainly on better economic ties between industrial and developing nations. In the USA, which he visits next, Brandt delivers speeches at Vanderbilt University in Nashville and to UN ambassadors in New York. 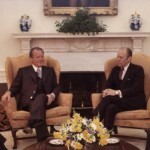 In addition, the former Chancellor speaks in Washington on 27 March 1975 with President Gerald Ford and Secretary of State Henry Kissinger, whom he asks to support democracy in Portugal. At the end, Brandt makes a side trip to Caracas and Venezuelan President Carlos Andres Péres. On 2 April 1975, Brandt assesses his journey at a Federal Press Conference in Bonn. 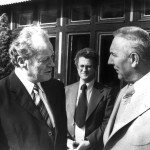 On 24/25 May 1975, Willy Brandt meets with Austria’s Chancellor Bruno Kreisky and Sweden’s Prime Minister Olof Palme in Vienna. Since 1972 these chairmen of their respective countries’ social democratic parties have been regularly exchanging ideas on the theory and practice of democratic socialism. During the autumn of 1975 the three politicians’ letters and discussions on these issues appear in book form. 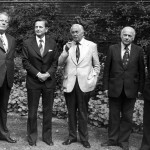 At the meeting in Vienna, Brandt, Kreisky and Palme, who are also close friends in private, contemplate specifically the establishment of a new international network. For this project they want to win world-wide support from parties and movements not originating from workers’ movements which favour the ideas of democratic socialism. Above all, Brandt hopes to find new partners in Central and South America. 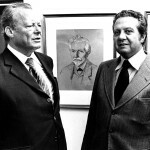 At the invitation of the conservative Prime Minister, Konstantinos Karamanlis, Willy Brandt visits Greece from 20 to 24 June 1975. The SPD chairman expresses his solidarity with the country which has returned to democracy after the collapse of the military dictatorship in July 1974. Brandt also wishes to strengthen the social democratic elements in Greece and in the Mediterranean region as a whole. Besides discussions with leading representatives of the government, meetings in Athens with left-leaning opposition politicians are on his programme as well. The German guest welcomes and supports Greece’s application for membership in the European Community (EC). On 24 June, Brandt flies to Belgrade where, on the following day, he meets once more with Yugoslavia’s President Tito. 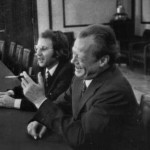 Willy Brandt is received like a state visitor when he arrives in Moscow on 2 July 1975. The SPD chairman is responding to an invitation by General Secretary Leonid Brezhnev, with whom he conducts two extensive discussions on 3 and 9 July. The subjects include German-Soviet relations, the future of détente policies after the impending conclusion of the Conference on Security and Co-operation in Europe (CSCE) as well as developments in the Middle East and the Mediterranean region. Concerning the situation in Portugal, Brandt gives Brezhnev a letter from Mário Soares and appeals to him to exercise a moderating influence on the Portuguese communists. During his one-week visit in the Soviet Union, the former Chancellor also travels to Leningrad, Novosibirsk (Siberia) and Samarkand (Uzbekistan). 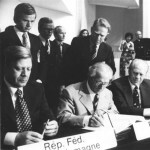 On 1 August 1975 in Helsinki, 33 European and the two North American national and government leaders sign the Final Act of the Conference on Security and Co-operation in Europe (CSCE). Therein, the countries pledge themselves to observe the sanctity of borders, not to intervene in internal affairs, to preserve human rights and to further East-West co-operation in many areas. With this, the communist regimes in Eastern Europe believe to have secured their power. The hope in the West is that exchanges across borders could initiate a transformation in the Eastern bloc. In an interview, the SPD chairman, Willy Brandt, considers the Helsinki Final Act to be a historic document. However, he warns about overly ambitious expectations, principally for German-German relations. 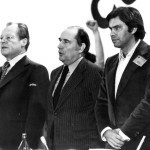 On 5 September 1975 in London, the chairmen of social-democratic and socialist parties in Western Europe, among them Harold Wilson, Olof Palme, Bruno Kreisky, Joop den Uyl and François Mitterrand, elect Willy Brandt to head the “Committee for Friendship and Solidarity with Democracy and Socialism in Portugal.” In addition, the solidarity committee, founded a month earlier in Stockholm, adopts a programme of action. Brandt and his friends fear a communist coup in Portugal as in Czechoslovakia in 1948. In the ranks of the committee, the possibility is under consideration, in such an eventuality, of giving military support to the democratic elements led by Mário Soares and his Socialist Party. To the contrary, the US government believes that the West has already lost Portugal. On 14 November 1975 at its national party convention in Mannheim, the SPD again elects Willy Brandt its chairman with 407 of 418 votes. 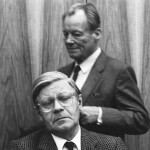 In the “troika” with Federal Chancellor Helmut Schmidt and faction head, Herbert Wehner, Brandt provides for that the party holds together. Despite personal friction, he faithfully supports Schmidt’s government policies. The most important domestic policy resolution is the “Framework of Orientation ’85,” which presents guidelines for the SPD’s reform policies in the coming ten years. For the first time the focal point in the debate on the SPD’s international reform policies is the North-South Conflict. In the presence of 36 guest delegations from all over the world, Brandt announces the founding of an “Alliance for Peace and Progress,” to establish contacts with non-communist leftist parties outside of Europe. 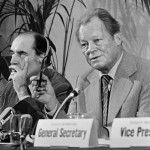 In a press conference in Bonn on 19 December 1975, Willy Brandt takes a detailed position concerning developments on the Iberian Peninsula. In Portugal, the democratic elements have succeeded in decisively driving back the communists and leftist radicals. After the death of the dictator Francisco Franco, on 20 November 1975, Spain is at the threshold of a new beginning politically. Brandt challenges democratic Europe to help both countries in establishing democracy. At the same time, he affirms the support of the SPD for the socialist parties of Portugal and Spain. The SPD chairman regularly exchanges ideas with their leaders, Mário Soares and Felipe González. A special relationship of trust quickly develops between Brandt and González who is only 33 years old. 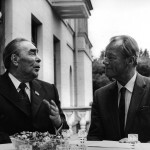 Since his visit to the Soviet Union in early July 1975, Willy Brandt and Leonid Brezhnev have been writing letters to exchange ideas on the international situation and German-Soviet relations. In a letter from late 1975, Brezhnev complains in a round-about way about the West calling for the preservation of human rights in Eastern Europe by invoking the Helsinki Final Act of the CSCE. In his reply of 7 January 1976, the SPD chairman concedes that “in some places” there have been “one-sided, sometimes also illusionary judgements and interpretations of the results of the conference.” However, Brandt also advises Brezhnev to examine his own failures. He suggests that Soviet armament projects and the developments in Portugal have not promoted the easing of tensions. 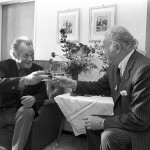 On 18 February 1976 in Bonn’s Wünsche Gallery, Willy Brandt meets Andy WarhoI. The US artist wishes to produce portraits of the former Chancellor and, with that, complete his pictorial series of personalities from culture and politics. Observed by approximately 80 journalists, within a half-hour Warhol takes a total of 26 Polaroid photos of Brandt. Afterwards, based on the photo originals, he creates five acrylic silk screen prints on canvas which are then finished six weeks later. They are presented to the public on 3 July 1976. 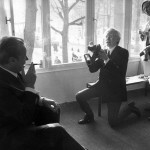 Four pictures, which are otherwise distinguishable from one another, show Willy Brandt as he holds a cigarette to his mouth with a cigarette holder. The motif in glaring colours is a classic of pop art. One of these art works is sold to benefit UNICEF. 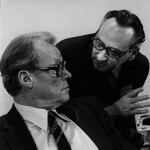 Shortly after Easter 1976, Austria’s Federal Chancellor, Bruno Kreisky, publicly endorses Willy Brandt to become the new President of the Socialist International (SI). Brandt, who has just spent a ten-day vacation on the Mediterranean island of Malta, promptly denies his interest in the soon available office. On 26 April 1976, in a letter to Kreisky, he substantiates his refusal which he already expressed in Porto in mid-March at a meeting of the Solidarity Committee for Portugal. Brandt names as reasons, besides his workload as SPD chairman, the especially miserable organisational condition of the SI. However, the unusually long letter can be read as a list of demands to be fulfilled before Brandt will consent to be a candidate. 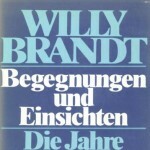 Two years after his resignation as Federal Chancellor, Willy Brandt presents his second autobiographical work. The book “Begegnungen und Einsichten” (“Encounters and Insights”), which is actually written largely by Klaus Harpprecht, deals with the years from 1960 to 1975. The volume of memoirs is based mostly on confidential files and records of the discussions which Brandt conducted in Bonn with international politicians as Governing Mayor of Berlin, as Foreign Minister of the Grand Coalition and as Federal Chancellor. For the first time, he reveals publicly that in September 1962 he had feared a Soviet attack on West-Berlin. Starting on 17 May 1976, before publication of the book, the news magazine “Der Spiegel” publishes lengthy excerpts in six instalments. The English edition of the book is published in 1978 with the title “People and Politics”. From 22 until 25 May 1976, 13 European and 15 Latin American parties are present at the start of the “Alliance for Peace and Progress” in the Venezuelan capital of Caracas. 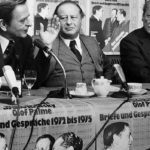 The forum for discussions, whose founding was announced half a year earlier by Willy Brandt, will serve to consolidate the forces for democratic socialism in the world. This idea finds a powerful resonance in Latin America. One principal reason is the high regard which Brandt enjoys internationally. On 18/19 June 1976, in an extra-ordinary party convention in Dortmund’s Westphalia Hall, the SPD rings in the hot phase of the Bundestag election campaign. The delegates and thousands of adherents celebrate Federal Chancellor Helmut Schmidt and the party chairman, Willy Brandt, who demonstrate their unity. On 3 October 1976, the SPD intends to defend its social-liberal majority against the CDU/CSU and their chancellor candidate, Helmut Kohl. Willy Brandt again travels frequently in the 1976 Bundestag election campaign. Among the events on the SPD chairman’s schedule is a hike with party friends on 17 July 1976 in the Senne, a scenic region south of Bielefeld on the edge of the Teutoburg Forest. During a stop for rest, an associate of the public relations division of the party’s executive committee takes a photo which soon achieves cult status. 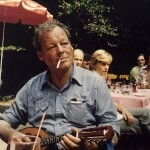 On a mandolin, which a woman had brought along, Brandt practices in a casual mood a few bars which he learned as a child in Lübeck. In 1977, the SPD headquarters makes a poster from the snapshot. It is very much in demand among SPD supporters and still sells well to this day. By contrast to the poster, some of Brandt’s fellow hikers can be seen in the background of the original photo. Despite some losses, in the elections to the 8th Bundestag, the social-liberal coalition keeps the upper hand with 253 seats. The SPD with Federal Chancellor Helmut Schmidt achieves 42.6%, the FDP with Foreign Minister Hans-Dietrich Genscher 7.9% of the votes. The CDU/CSU and its Chancellor candidate Helmut Kohl narrowly miss an absolute majority with 48.6% and 243 seats. 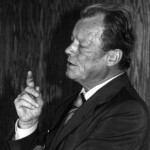 In the “Bonner Runde” (“Bonn Round”) of party chairmen, televised on the evening of the election day, Willy Brandt does acknowledge the gains of the CDU/CSU. But at the same time, he underscores the fact that SPD and FDP have the mandate to form a government. 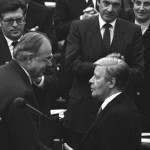 After the conclusion of coalition negotiations, Helmut Schmidt is re-elected Chancellor by the Bundestag on 15 December 1976. However, he receives only one vote more than absolutely necessary. On 26 November 1976 at the 13th Congress of the Socialist International in Geneva, Willy Brandt is elected the new President of the SI. Concerned with the Bundestag elections, it was not until late October that the SPD chairman at an unofficial party leaders’ conference in Portugal did give in to the urging of his international friends and declare himself ready to be a candidate. In his speech after being elected, Brandt calls on the International to support three offensives: for peace, for new North-South relations and for human rights. To conquer hunger, to overcome the crisis in the international economy and to protect the environment, he calls for radical rethinking. Brandt wants to see that the family of SI parties is heard again in international politics and gains new members beyond Europe. 37 years after the end of the Spanish Civil War, the Socialist Workers’ Party of Spain (PSOE) is able, for the first time, to hold a party convention again in its own country. 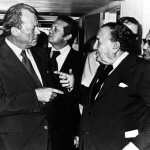 On 5 December 1976, Willy Brandt attends the congress taking place in Madrid. The SPD chairman delivers his guest speaker’s address in Spanish, which he learned to an extent in school and during his stay in Barcelona in 1937. 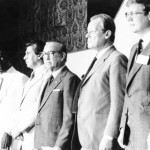 In a speech in Boston on 14 January 1977, World Bank President Robert S. McNamara makes a startling suggestion: To overcome the stalemate in relations between industrialised and developing nations, an independent North-South Commission should be founded under the direction of Willy Brandt. In a letter delivered to the former Chancellor on 28 December 1976 at his vacation location in the south of France, McNamara asked in advance for his consent to express this idea publicly. Brandt agrees. In his written reply to McNamara dated 28 January 1977, Brandt states that they must avoid any appearance of conflict with North-South discussions by the Conference on International Economic Co-operation (CIEC), which has been meeting in Paris since 1975. 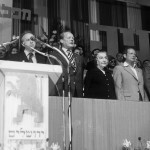 Together with Olof Palme, François Mitterrand and Bruno Kreisky, Willy Brandt takes part on 22 February 1977 in convening the convention of the Israeli Workers’ Party in Jerusalem. In his speech, the President of the Socialist International appeals to the responsible parties in the Middle East to eliminate war as an instrument of politics and to seek a fair compromise through negotiations. Brandt affirms Israel’s right to exist within secure and recognised borders. At the same time, he advocates enabling the Palestinians to realise their national identity. But the Workers’ Party continues to reject recognition of the PLO. 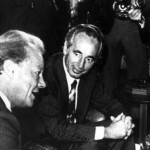 The convention is defined by a power struggle between Prime Minister Yitzhak Rabin and his rival Shimon Peres. On 8 March, Brandt also speaks in Washington with World Bank President McNamara about the founding of a North-South Commission, which the SPD chairman is fundamentally prepared to chair. During this America trip, Brandt also visits Boston, Princeton and New York. The Juso’s national chairman, Klaus-Uwe Benneter, who calls into question the party membership of the Jusos and does not want to adhere to the delimitation resolutions vis-à-vis the communists, is a particular source of annoyance for him. Therefore, on 27 April 1977, the executive committee of the party suspends Benneter’s membership rights and formally requests his removal from the party in order to, according to a statement by Brandt, avert damage to the SPD and its youth organisation. In September 1977, the SPD’s national commission of arbitration accepts the application and excludes Benneter. In 1983, the SPD renews his party membership. In early 1977, human rights advocates in Czechoslovakia publish a petition which calls on the communist regime in Prague, with reference to the CSCE Final Act of 1975, to respect human rights. 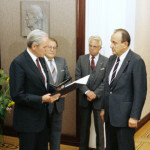 One of the first signers of “Charta 77” is the former Czechoslovakian foreign minister, Jiří Hájek. In a letter dated 17 May 1977, Willy Brandt informs his former colleague in office with how much respect he is following this commitment. 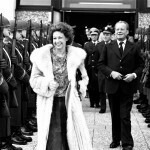 Six and a half years after his first visit, Willy Brandt travels in late June 1977 for four days to Poland. Accompanied by his wife Rut as well as the SPD politicians, Hans-Jürgen Wischnewski and Karsten D. Voigt, he meets in Warsaw with the heads of the communist regime. His most important interlocutor is Edward Gierek, the First Secretary of the Polish United Workers’ Party (PVAP), who also invites the German guest to a convalescent home in Rybaki (formerly Lansk) in Masuria. In addition, Brandt visits the city of Toruń and the former German KZ (concentration camp) Stutthof in the vicinity of Gdańsk. Immediately following the trip to Poland, the SPD chairman and SI President visits Helsinki from 1 to 5 July, where, among other things, he meets with the leaders of the social democratic party of Finland. In late August 1977, a three-day conference takes place in Rotterdam on “Future Prospects for Chile” which is organised by the Socialist International (SI), the Netherlands’ Partij van de Arbeid and the Institute for the New Chile. 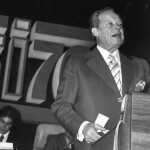 In his keynote address, SI President Willy Brandt expresses his solidarity with the victims of the dictatorship of General Augusto Pinochet, ruler since September 1973. At the same time he utters his hope that in Chile also, freedom and democracy can assert themselves against repression, torture and despotism. Brandt calls on all democratic forces of the country to work together and promises them the support of the SI. Without saying so, he thereby endorses the inclusion of the Chilean Christian democrats in the opposition alliance. On 28 September 1977 at UN headquarters in New York, Willy Brandt announces to the international press corps the founding of the “Independent Commission on International Development Issues” under his leadership. The decision comes after months of hesitation. In numerous discussions with foreign ministers and ambassadors, the former Chancellor is able to dispel the misgivings of some developing nations against the North-South Commission suggested by World Bank President Robert McNamara. Brandt is convinced that the body can point out possible solutions for the North-South conflict which he characterises as the “decisive social issue for the rest of our century.” However, as he stresses in an interview with the “Süddeutsche Zeitung,” his principal function remains the chairmanship of the SPD. In 1977, the “Red Army Faction” (RAF) directly challenges the West German state. 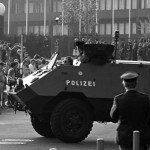 The kidnapping of the President of the Employers’ Federation, Hanns Martin Schleyer, on 5 September and the hijacking of a Lufthansa aircraft on 13 October puts the Federal Republic in a state of emergency. Federal Chancellor Helmut Schmidt (SPD) refuses to meet the demands of the kidnappers and to release eleven RAF terrorists. On 18 October 1977, the remaining 86 hostages on the aircraft are freed in Mogadishu, whereupon three leading imprisoned RAF members commit suicide. On the same day, Schleyer is murdered by his abductors. 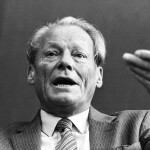 Willy Brandt, who stood at the Chancellor’s side in the crisis management group, as did the chairmen of the CDU, CSU and FDP as well, states his position on the events in a contribution for the “Hamburger Morgenpost” of 22 October 1977. 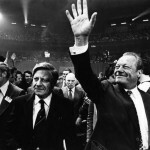 The SPD’s national party convention in Hamburg from 15 to 19 November 1977 brings no surprises with the election of the party’s chairman: Willy Brandt is re-elected with 413 of 433 votes. The topic which the delegates discuss with particular intensity is energy policy. Erhard Eppler is the leader of those who reject Federal Chancellor Helmut Schmidt’s call to develop atomic energy. The SPD’s regional association in Schleswig-Holstein, which opposes the AKW (atomic energy plant) in Brokdorf, has in principle spoken out against nuclear energy. Brandt contributes to the party convention adopting the compromise formulation “keeping options open.” For the time being, the SPD considers a renunciation of atomic energy to be indefensible. But there should also be no new AKWs without a clarification of the issue of atomic waste disposal. On 9 December 1977 in Gymnich Palace near Bonn, Willy Brandt, as its chairman, convenes the first meeting of the “Independent Commission on International Development Issues.” The 20 additional members of the body, all chosen by him, come from seven industrial and eleven developing nations. The North-South Commission covers a broad political spectrum. The most prominent members are the British conservative, Edward Heath, the Swedish social democrat, Olof Palme, the Chilean Christian democrat, Eduardo Frei, and the Guyanese General Secretary of the Commonwealth, Shridath Ramphal. In his greeting, Brandt expresses optimism that his commission can dismantle the spirit of confrontation between North and South and replace it with increased mutual interest. On 17 December 1977, Willy Brandt leaves for a three-week Asia and Africa trip. First stop is Tokyo. There, the 65-year-old remains for three days to participate in a conference of party leaders of the Socialist International. Besides that, he speaks with Japanese government leaders, among them Prime Minister Takeo Fukuda, about the work of the North-South Commission. Accompanied by his youngest son, Matthias, Willy Brandt spends Christmas on Mauritius. A three-day visit in Tanzania follows. Highlights are a flight on 27 December from Dar-es-Salaam over Kilimanjaro, the Ngorongoro Crater and the Serengeti Plains to Lake Victoria and a subsequent meeting with President Julius Nyerere in his home village of Butiama. The following day, Brandt flies on to Zambia. 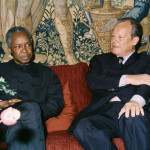 In Zambia’s capital city, Lusaka, where he has been since 28 December, Willy Brandt meets several times during the 1977/78 change of years with President Kenneth Kaunda. Principal subjects are the North-South Commission and the situation in Southern Africa. For the first time, Brandt also speaks with leading representatives of the liberation movements from Rhodesia (ZAPU and ZAMU), Namibia (SWAPO) and South Africa (ANC) who are fighting to end repression of blacks by white minority governments. The SPD chairman no longer rules out sanctions against the South African apartheid regime. After a stop-over in Nairobi, he returns to Germany on 7 January 1978. Following that, Brandt gives the “Frankfurter Rundschau” an interview on the outcome of his three-week trip. 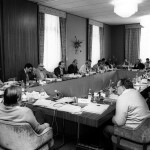 From 10 until 12 March 1978, the members of the North-South Commission come together for their second meeting in Mont Pèlerin (Switzerland). In the town above Lake Geneva they adopt a work programme and listen to experts. 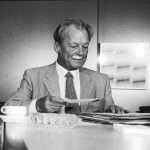 In order to more closely define the central idea of the “mutuality of interests” between industrial and developing nations, Willy Brandt presents for discussion a ten-point-paper authored by him. The chairman of the Commission is convinced that global problems in the area of armaments, economics and environment can only be solved through international co-operation whose most important mainspring is the common interest of nations in the survival of humanity. Brandt’s thoughts meet with broad agreement in the Commission. An arms reduction conference of the Socialist International (SI) takes place in Helsinki from 24 to 26 April 1978 at which, for the first time, representatives of the Soviet communists also take part. In his speech, Willy Brandt stresses that the arms race can only be ended if the policy of détente between East and West is continued. The SI President challenges the USA and the Soviet Union to be pacemakers for arms control and reduction and to soon conclude the second Strategic Arms Limitation Treaty (SALT II). Brandt welcomes the 7 April 1978 determination by US President Jimmy Carter to delay the decision on production of the “neutron bomb.” In Western Europe there is stiff resistance to this strongly radiating atomic weapon. 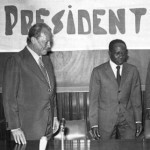 In mid-May 1978, Willy Brandt again visits the African continent. The “bureau” of the Socialist International convenes on 12/13 May in the Senegalese capital city, Dakar. This is the first meeting of an SI committee in Africa. As did the Caracas conference in 1976, the meeting serves mostly to facilitate contacts with parties from the region which do not yet belong to the International. The idea for such a meeting originates with a letter by the SPD chairman to Senegal’s President Senghor. From 14 to 17 May, Brandt participates in the third meeting of the North-South Commission in Bamako (Mali). Following that, he visits Algeria from 19 to 21 May. The highlight is a three-and-a-half-hour-long discussion with President Boumedienne, whom Brandt met once before in April 1974. After meetings with the Hungarian state and party boss, János Kádár, in late March in Budapest and with the Soviet General Secretary, Leonid Brezhnev, in early May in Bonn, Willy Brandt also speaks in early June 1978 in Sofia and in Bucharest with the communist leaders of Bulgaria and Romania. At his meetings with Todor Shivkov und Nicolae Ceaușescu, the foremost topics are the future of East-West détente and development policy. Brandt informs his interlocutors about the work of the North-South Commission headed by him and touts bloc-spanning co-operation against hunger in the world. The fact that in Bucharest he publicly endorses the idea of an international tax for development projects, encounters sharp criticism by the CDU/CSU. From 4 until 19 July 1978, Willy Brandt undertakes a tour through the capital cities of the European Community (EC). In London, Dublin, Paris, Rome, Bonn, Luxembourg, The Hague, Brussels and Copenhagen, he personally informs government heads and ministers as well as representatives of international organisations about the consultations of the North-South Commission which he chairs. On 9 July 1978, Brandt also makes a stop in Vienna. There he participates in a discussion, together with Austria’s Federal Chancellor, Bruno Kreisky, between the Egyptian President, Anwar al-Sadat, and the Israeli opposition leader, Shimon Peres. In a statement, they call on Egypt and Israel to continue their peace negotiations. On 13 July 1978 in Rome, Brandt is received for a private audience by Pope Paul VI. In late August 1978, the members of the North-South Commission assemble in Tarrytown, near New York City, for their fourth meeting. Among other matters, this time the agenda includes, next to the subject of interdependence, the discussion points of indebtedness, transfer of resources, work migration and “brain drain” as well as nutrition and agriculture. As always, at the beginning is the “Chairman’s Report.” In it, Willy Brandt informs his colleagues mostly about the numerous discussions which he conducted in the previous months with statesmen from all over the world. Even the Cuban chief of state, Fidel Castro, would be glad to meet with the chairman of the Commission, as Jan Pronk reports to him. During a trip to Cuba in July 1978, the Dutch treasurer of the North-South Commission handed Castro a letter from Brandt. 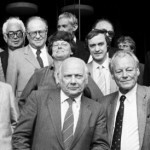 In September 1978 again, several foreign appointments are on the programme for Willy Brandt. First, he visits Yugoslavia, which plays an important role in the non-aligned movement. On 7/8 September in Ljubljana, he exchanges ideas about the work of the North-South Commission with leading politicians of the country, most notably with Tito, the head of state. Three weeks later, the 64-year-old participates in a meeting in Paris of the “bureau” of the Socialist International. Under the leadership of its President, the SI makes the decision to support the opposition rebelling against the Somoza regime in Nicaragua. Afterwards Brandt travels to the Portuguese town of Estoril where the conference “Processes of democratisation on the Iberian Peninsula and in Latin America” is taking place from 30 September until 2 October. 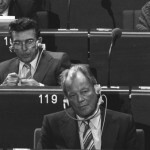 In late October 1978, Willy Brandt once more flies to the USA. A year after the founding of the North-South Commission, he wishes to inform international organisations, UN ambassadors from “Third-World” countries and the US government about the commission’s work status. On 26 October in New York, Brandt speaks with UN Secretary General Kurt Waldheim, who is supposed to be the first to receive the final report of the commission planned for autumn 1979. On the same day, the former Chancellor calls for a new international order in a speech to the United Nations Association. On 28 October in Washington, Brandt takes part in a dinner at the German Marshall Fund before he has to cancel all appointments and stay in bed with a fever. It is not recognised at the time that the 64-year-old is suffering from a “silent” heart attack. 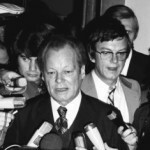 Although his health has been seriously affected, Willy Brandt travels in early November 1978 from Washington to the Canadian city of Vancouver to the Congress of the Socialist International (SI). He is supposed to and also wants to appear there, because, most importantly, his re-election as SI President is pending. The confirmation in the office is only a matter of form. However, Brandt feels so ill during his speech that he has to hold on tightly to the podium, as he later reports in an interview with the news magazine “Der Spiegel”. Not until his return to the Federal Republic do his doctors determine in mid-November 1978 that Brandt has suffered two attacks on the front cardiac wall and has come down with an inflammation of the lungs. The SPD chairman is treated in the Elisabeth Hospital in Bonn and has to relinquish all of his professional duties for the time being. Willy Brandt spends his 65th birthday in the Elisabeth Hospital in Bonn, where he has been under treatment since mid-November due to two heart attacks. Therefore, the festival planned by the SPD in Dortmund’s Westphalia Hall has to be cancelled. Despite his illness, on 9/10 December 1978 at an extra-ordinary party convention in Cologne, the social democrats selected him to be their top candidate for the European parliamentary elections in June 1979. Shortly before he finally leaves the hospital on Christmas Eve, Brandt signals his return to the party leadership with a letter to the SPD faction chairman, Herbert Wehner, and a congratulatory letter to Federal Chancellor Helmut Schmidt on his 60th birthday. After Christmas, he travels to the South of France for a convalescence period of several weeks. In early 1979, Willy Brandt in a rehabilitation clinic in the Southern French city of Hyères is recovering from two heart attacks which he suffered two months ago. A lot of exercise, a low-salt diet and strict oversight by doctors assure his rapid recovery progress. Brandt devotes the four hours of work per day which he is allowed during the six-week convalescence to the North-South Commission. His friends Klaus Harpprecht and Egon Bahr visit him, but Rut Brandt is not allowed to see him. Their marriage still exists only on paper. During his convalescence, Willy makes the decision to separate from Rut. His new life partner is the 32-year-old historian Brigitte Seebacher. She works as a speech writer for the SPD chairman and has been at his side privately for a good while. 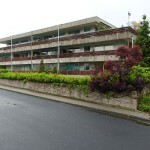 In late February 1979, as almost a year ago, a further meeting of the North-South Commission takes place in the Swiss city of Mont Pèlerin. Due to his heart condition, Willy Brandt was unable to participate in the previous meeting in Kuala Lumpur in late November 1978. Because that meeting proceeded quite controversially, the Commission is now pressed for time. At the beginning, Brandt emphatically appeals to the members’ consciences. In his “Chairman’s Report,” he challenges them to a concentrated discussion and stresses that the final report must come on the market in October 1979. At the same time, he outlines the contents which should be handled in it. Brandt also announces that in his capacity of chairman he will write an introduction which must be an integral component of the report. After the separation from his wife Rut, Willy Brandt moves with his new partner, Brigitte Seebacher, to the small town of Unkel, located in the right bank of the Rhine about 20 kilometres south of Bonn. The top-floor apartment on Eschenbrenderstraße 4, where the two live together starting on 1 April 1979, has five rooms and a large patio. Here the couple will live until their move into a new house at Auf dem Rheinbüchel 60 in November 1989. The convalescence in early 1979 and his new love have positively rejuvenated Brandt. He takes care to get enough sleep, has lost weight and looks firmer. Furthermore, the fact that the SPD chairman is wearing more fashionable clothes can be attributed as well to the young woman at his side. In early May 1979 in the Eastern French city of Annecy, the members of the North-South Commission assemble for their seventh meeting. Under the leadership of its chairman, Willy Brandt, its discussions are centred principally on the structure of the recommendations in the final report. Highly controversial in nature are the debates about financial and monetary issues as well as about possible reforms at the World Bank and the International Monetary Fund (IMF). Especially contentious are the ideas of imposing international taxes for development aid and establishing a World Development Fund. 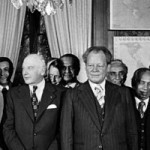 With reference to his discussions with UN Secretary General Waldheim in April and World Bank President McNamara in March 1979, Brandt proposes for the first time a North-South summit conference with about 30 to 40 heads of government from all over the world. On 7 and 10 June 1979 in the nine member nations of the EC, direct elections to the European Parliament take place for the first time. With their top candidate, the SPD in the Federal Republic of Germany gains 40.8% of the vote. With that the social democrats win 35 of the 81 German mandates. The CDU/CSU achieves 49.2% (42 seats), while the FDP reaches 6.0% (4 seats). In mid-July 1979, Brandt takes part in the constitutive assembly of the European Parliament in Strasbourg. As are all of the SPD representatives, among whom are Heinz-Oskar Vetter, the chairman of the DGB (Federation of German Trade Unions), as well as Gerd Walter and Heidemarie Wieczorek-Zeul, he is a member of the socialist faction. With 113 of 410 seats, it is the largest one. 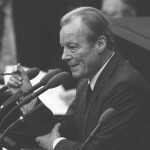 In his first speech in the plenum on 19 July 1979, Brandt criticises the fact that the parliament did not get off to a good start. 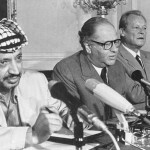 On the fringes of the eighth meeting of the North-South Commission from 4 until 9 July 1979, Willy Brandt and Austria’s Federal Chancellor, Bruno Kreisky, meet in Vienna for the first time with the leader of the Palestine Liberation Organisation (PLO), Yasser Arafat. 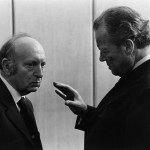 In their following joint press conference on 8 July 1979, Brandt refutes the charge of disloyalty towards Israel. 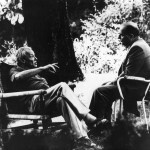 In addition, the President of the Socialist International (SI) discloses that it was explained to him that the PLO aspires to realise the self-determination of Palestinians “without extermination or destruction.” As Brandt stresses at a meeting of the SI bureau in late October 1979 in Lisbon, he feels even more strongly convinced that there can be no lasting peace in the Middle East without the participation of the PLO. 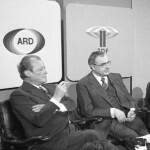 On 25 September 1979, Willy Brandt speaks with Federal Chancellor Helmut Schmidt and the Federal Minister for economic co-operation, Rainer Offergeld, about the upcoming final report of the North-South Commission. Also participating in the discussion in the chancellery in Bonn are the SPD federal party manager, Egon Bahr, and Minister of State Hans-Jürgen Wischnewski. Schmidt signals his agreement with the idea of a North-South summit meeting. However, the Chancellor rejects the changes to voting rights at the World Bank and the IMF which are endorsed by the Brandt Commission. Offergeld also expresses clear criticism. The minister definitively rejects new international institutions, such as i.e. a World Development Fund. Brandt agrees with some of the objections. He also reports that his commission could barely reach a consensus. Since the North-South Commission did not succeed in adopting its final report in July 1979 in Vienna, it has to hold a further meeting in Brussels three months later. But the new draft of the report from the secretariat in Geneva is still too long and too technical. Moreover, several proposals in it are controversial. 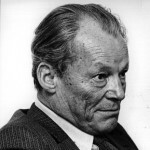 However, Willy Brandt insists that the text be balanced and understandable for a broad public. When the commission is still in disagreement after three days, the chairman withdraws to his room depressed. The imminent failure is prevented at the last minute: Edward Heath and Shridath Ramphal receive the assignment of forming an editorial team in London which is charged with completing the report in co-ordination with Brandt by mid-December. The adoption of NATO’s dual-track decision set for 12 December 1979 provides for intense East-West tensions. As a counter-weight to the Soviet SS-20 missiles which have been deployed since 1976 and targeted on Western European cities, the Atlantic alliance intends to station 108 Pershing II and 464 cruise missiles from the USA in Western Europe beginning in 1983. Simultaneously, NATO offers the Soviet Union negotiations to agree on a permanent balance of medium-range nuclear missiles. On account of the dual-track decision, Leonid Brezhnev and Willy Brandt resume their dialogue. In a letter to the Soviet General Secretary dated 14 November 1979, the SPD chairman makes it clear that he does not want rearmament but rather a negotiated settlement. Under the motto “Security for the 80s,” the SPD holds a controversial debate at its Berlin national party convention on NATO’s dual-track decision. In principle, the left-wing of the party rejects the planned deployment of new US medium-range nuclear missiles in Western Europe. 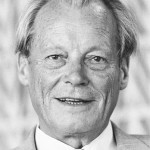 Willy Brandt also fears an atomic arms race but does not wish to oppose Federal Chancellor Helmut Schmidt, who is considered the initiator of the dual-track decision. The party convention accepts the decision by NATO under the condition that deployment of new missiles be halted if negotiations with the Soviet Union “lead to satisfactory results.” Nuclear energy and development aid are also fiercely debated. At his re-election to the SPD chairmanship, Brandt receives 360 of 402 votes. 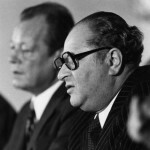 At a press conference in London on 17 December 1979, Willy Brandt can announce the conclusion of the work of his North-South Commission. In the days before, the Commission met in Leeds Castle for its tenth session. The members acceded to Brandt’s urgent admonition and adopted the North-South Report in the version which Edward Heath and Shridath Ramphal worked out in consultation with the chairman after the meeting in Brussels. In the face of a drastic increase in the price of oil, the Commission calls for an emergency programme to avert a threatening international economic crisis. The issue of energy is also the dominant subject of a trip to Kuwait and Saudi Arabia which Brandt undertook from 8 to 12 December 1979 along with eleven members of the North-South Commission. After Soviet troops march into Afghanistan on Christmas day 1979, a new ice age begins in East-West relations. In early January 1980, US President Jimmy Carter halts ratification of the treaty on the limitation of strategic nuclear weapons (SALT II) of 1979. In addition, he announces sanctions against the Soviet Union, which shall also include a boycott of the 1980 Olympic Summer Games in Moscow. On 12 February 1980 in New York, Willy Brandt officially hands over the report of his “Independent Commission for International Development Issues” to UN Secretary General Kurt Waldheim. The following day he also personally hands a copy to World Bank President Robert McNamara in Washington. The original English title of the “Brandt Report” is “North-South: A Programme for Survival”. The German edition is “Das Überleben sichern” (“Assuring survival”). 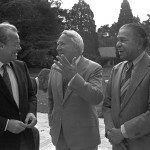 On 15 February 1980, Brandt is also received by US President Jimmy Carter, who honours the work of the North-South Commission as well. Carter also informs his German guest that he wants to continue with efforts to ease tensions and wants “neither to embarrass the Soviet Union nor to offend it.” Brandt passes this information on in a letter to Leonid Brezhnev. With its regional conference for Latin America and the Caribbean in late March 1980 in the Dominican capital city, the Socialist International (SI) wants to further develop its relationships with friendly parties in the region. Its goal is promoting democracy and overcoming right-wing dictatorships in Central and South America. SI President Willy Brandt considers the overthrow of the Somoza regime in Nicaragua by the Sandinistas in July 1979 to be the “key to democratisation.” Meanwhile, violence increases in Central America. At the beginning of the SI conference, Brandt and his friends commemorate Bishop Óscar Romero, a critic of the regime recently murdered in San Salvador. 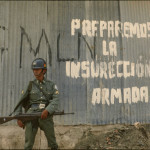 Supported by the USA, El Salvador’s military junta reacts with brutal terror which drives the country into a civil war. One recommendation of the North-South Report is especially dear to Willy Brandt: a summit meeting of heads of government from industrial and developing nations. 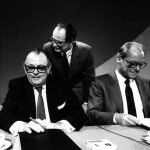 In a letter to Federal Chancellor Schmidt dated 27 May 1980, Brandt sees favourable opportunities for that. It is the result of his discussions with Mexico’s President, López Portillo, and Austria’s Chancellor, Kreisky, who have been sounding out the project internationally. Brandt, who has already spoken with US President Carter and France’s President, Giscard d’Estaing, asks Schmidt to support the idea among the seven leading industrial nations (G7). Meanwhile, the summit initiative makes only slow progress. In November 1980 and March 1981, foreign ministers from eleven nations assemble in Vienna for preparatory meetings. 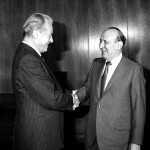 During the meeting of the “bureau” of the Socialist International (SI) from 11 to 13 June 1980 in Oslo, Willy Brandt and his colleagues meet with the Iranian foreign minister Sadegh Ghotbzadeh. The topic is the hostage affair in Teheran, where 52 American diplomats have been held prisoner in the US embassy since 4 November 1979. For that reason, Felipe González, Bruno Kreisky and Olof Palme have already travelled to the Iranian capital city for discussions with the Islamic regime. After weeks of massive strikes, the Polish government concludes an agreement on 31 August 1980 in Danzig with the representatives of the striking workers. Main points are the introduction of the right to strike and the certification of “Solidarność.” Chairman of the first free trade union in the communist sphere of control is the electrician Lech Wałęsa. In a statement, the SPD chairman, Willy Brandt, expresses his relief about the agreement in Poland. Non-intervention from outside made that easier. Brandt manifests considerable sympathy for the Polish workers. They “stood up for and defended their rights with courage, but also with admirable maturity.” In an interview in mid-September, he speaks against financial aid for Solidarność from the Federal Republic. In the election to the 9th German Bundestag, the social-liberal coalition in Bonn is reconfirmed. The CDU/CSU with Chancellor candidate, Franz Josef Strauß, receives only 44.5% (-4.1) of the vote. However, the SPD with Federal Chancellor Helmut Schmidt hardly benefits from the broad anti-Strauß mood in the election. They realise only slight gains and make it to 42.9%. The big winner is the FDP with foreign minister Hans-Dietrich Genscher, which reaches 10.6% (+2.7). The Greens, who offer candidates for the first time in a Bundestag election, clearly fail to surmount the 5% hurdle with 1.5%. In his comment on the results of the elections, Willy Brandt explains the success of the FDP with its clear statement that it wished to continue working with Schmidt and the SPD for another four years. On 5 November 1980, Schmidt is re-elected Chancellor. 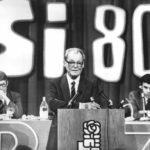 The Congress of the Socialist International in mid-November 1980 in Madrid confirms Willy Brandt in the office of President. In the Spanish capital, where the second CSCE follow-up meeting begins almost simultaneously, the SI speaks out clearly for a continuation of détente and disarmament policies. The expectations are directed first and foremost at the two superpowers, as Brandt writes afterwards in a letter to the Soviet General Secretary, Brezhnev. The SI President and SPD chairman hopes that Americans and Soviets soon take up negotiations on medium-range nuclear weapons. Though, Ronald Reagan, the victor of the US presidential election of 5 November 1980, is seeking a massive re-armament of the USA. Brandt is very reserved in his comments on the outcome of the election. After 32 years, the marriage of Willy and Rut Brandt is ended on 16 December 1980. Prior to that, they have reached a settlement on financial matters. After the session in court in Bonn, the two meet, accompanied by their attorneys, at the home of their son Lars. They sit with a glass of wine and tell amusing anecdotes. Rut’s hope for a lasting friendship with Willy will not be fulfilled. On the contrary: They will never see each other again after this meeting. Since 1980 a civil war has been raging in El Salvador between the Duarte regime backed by the military and the USA and the leftist guerrilla movement FMLN. The MNR party, which is led by Guillermo Ungo and is a member of the Socialist International (SI), is part of the opposition. That encounters sharp criticism by the SI member party PLN from Costa Rica which others join in on. The protest forces Brandt to plead again at once for a negotiated settlement. However, he refuses to play any role as mediator in El Salvador. Due to the worsening economic crisis, the social-liberal government adopts belt-tightening measures after the 1980 Bundestag elections. That causes quarrel in the SPD in which, at the same time, resistance against NATO’s dual-track decision is growing. In early 1981, 24 SPD representatives, referring to the North-South Report, demand that development aid must be increased by a billion DM. 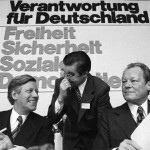 A 5-point statement, which the executive committee of the party publishes on 12 February 1981 at Willy Brandt’s initiative, is unable to end the SPD crisis. Faction head Herbert Wehner sees the danger of further division. 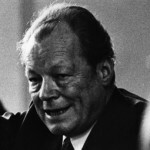 Soon afterwards, Brandt threatens on 21 February 1981 to relinquish the chairmanship of the party. But his precautionary resignation statements wind up remaining in his pocket. 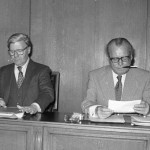 One year after an initial follow-up meeting in The Hague, the North-South Commission meets again in late May 1981 in West Berlin. In Villa Borsig, it prepares for the summit meeting which is scheduled for autumn 1981 in Cancún (Mexico). In a speech at the Technical University, the chairman, Willy Brandt, condemns high armament expenditures and increasing hunger in the world. In addition, he bemoans the disinterest of many governments and the German public in the North-South Report. 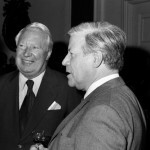 At a dinner on 29 May 1981, a fierce dispute on those issues develops between members of the Commission and Federal Chancellor Helmut Schmidt, an invited guest. Brandt is unusually harsh in his comments to the press about the incident: The Federal Republic’s development policy, in his opinion, is behind the times. Two years after its revolution, Willy Brandt looks back with increasing concern at Nicaragua. The Sandinistas have forced competing political elements out of the government and are drawing ever closer to the Soviet Union. The new American President, Ronald Reagan, wants to prevent a second Cuba and is supporting the “Contra rebels” who have been fighting a guerrilla war against the Sandinistas since early 1981. An invasion by US troops also seems possible. “To defend the revolution in Nicaragua,” in November 1980 the Socialist International (SI) founded a committee chaired by Felipe González. He is supposed to make it clear to the Sandinista leadership, according to Brandt in a letter dated 2 June 1981, that the SI cannot approve of a dismantling of pluralism and constitutional legality. In late June 1981, Willy Brandt accepts an invitation from Leonid Brezhnev and travels to Moscow. In the nearly three-hour discussion which the two conduct on 30 June at the Kremlin, the dominant topic is NATO’s dual-track decision. The Soviet General Secretary advocates negotiations on medium-range nuclear weapons and demands, among other things, also including British and French systems. Brandt is firmly convinced of Brezhnev’s desire for peace, as he emphasises in an interview with the news magazine “Der Spiegel.” The SPD chairman evaluates positively the renewed Soviet offer not to deploy any more SS-20 missiles. However, to Brandt’s anger, the USA and the social-liberal federal government in Bonn reject the proposal of a moratorium as unbalanced. On their vacation in France, Willy Brandt and Brigitte Seebacher are invited by the new President, François Mitterrand, on 20 August 1981 to a farm in Nogaro. After a brief visit together to the GDR in early March, the inauguration of Mitterrand in May and a meeting of the Socialist International in mid-July in Bonn, it is the fourth encounter this year for the two politicians. 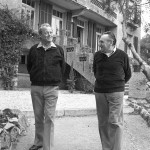 During their discussion in Nogaro and an additional meeting on 25 September 1981 in Paris, differing positions on NATO’s dual-track decision come to light. Mitterrand is indeed in favour of negotiations on medium-range nuclear weapons, but without including the French systems. In addition, he considers an arms build-up for NATO necessary to restore the balance. Six weeks before the “International Conference on Co-operation and Development“ in the Mexican city of Cancún, Willy Brandt and Shridath Ramphal write a letter to the participants in the first North-South summit meeting in history. It is an urgent appeal to the political leaders from 22 industrial and developing nations to come to an understanding on common measures for overcoming North-South problems. With reference to the proposals of the North-South Commission, Brandt and Ramphal urge above all an immediate programme to combat the international economic crisis which has hit developing nations especially hard. However, the summit meeting falls short of these expectations. Participants at the conference in Cancún on 22/23 October 1981 are, among others, Ronald Reagan (USA), Margret Thatcher (Great Britain), Zhao Ziyang (China), Indira Gandhi (India) and Julius Nyerere (Tanzania). Since Federal Chancellor Helmut Schmidt must cancel due to illness, the Federal Republic is represented by Foreign Minister Hans-Dietrich Genscher. From the outset, the Soviet Union and its allies remain absent from the meeting. 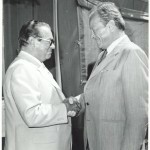 Also absent from Cancún is Willy Brandt, to whom the idea for the summit is attributed. A week after the conference, the chairman of the North-South Commission must admit in an interview for the “Frankfurter Rundschau” that there was hardly any substantial progress made. On the advice of friends from developing nations, Brandt does not express his disappointment more clearly. 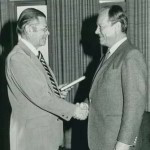 On 3 October 1981 in New York, the international Jewish organisation, B’nai B’rith awards Willy Brandt with its gold medallion for humanitarian achievements. In the following days, the SPD chairman conducts discussions with UN ambassadors from developing nations about the upcoming North-South summit meeting in Cancún. At the conclusion of his visit, Brandt meets in Washington D. C. with the US Secretary of State, Alexander Haig. In addition to North-South issues and the situation in Poland, the anti-nuclear weapons protests in the Federal Republic are also a subject of the talks. Brandt shows understanding for the peace movement which he does not consider anti-American. Haig assures him, the USA would seriously negotiate with the Soviet Union at the discussions on medium-range nuclear weapons (INF) scheduled to begin again in Geneva in late November 1981. On 3 November 1981, a speech by Willy Brandt on the occasion of the 100th anniversary of the Dietz Publishing Company, causes quite a stir. A sentence from it is subsequently quoted widely: “Peace is not everything, but everything is nothing without peace.” With that, the SPD chairman moves closer to the peace movement which is protesting more and more against atomic weapons and rejects NATO’s dual-track decision. 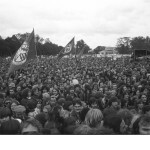 On 10 October 1981, over 300,000 people took part in the largest peace demonstration until then in Bonn’s Hofgarten. Association with the peace movement is highly controversial in the SPD. As early as 21 September, Brandt refuses, in a letter to Federal Chancellor Helmut Schmidt, to agree to the latter’s demand to prevent Erhard Eppler from speaking at the rally in Bonn and to call on SPD members not to take part. 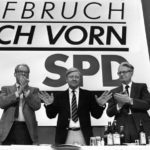 The right wing of the SPD considers party chairman Willy Brandt’s approach to the peace and environmental movement a mistake. In November 1981 in “Six Theses on the Identity of Social Democracy,” the political scientist, Richard Löwenthal, focuses his criticism on his old friend’s course of action. Previously, Brandt stated in a speech that the SPD should open up to the new, green-alternative groups of voters. Instead of their integration, Löwenthal calls for dissociating from “fringe groups” which in his opinion demonize the “industrial society based on the division of labour.” A signature campaign, in which, among others, Herbert Wehner participates, fuels public attention to the paper. Brandt energetically refutes Löwenthal’s theses in an interview published on 6 December 1981. Willy Brandt reacts in a very reserved manner to the declaration of martial law of 13 December 1981 in Poland, the prohibition of the trade union “Solidarność” and the arrest of its leaders. In a statement of the SPD executive committee on 16 December and in an initial response of the Socialist International (SI) one day later, the actions of General Jaruzelski are not expressly condemned. The SI statement encounters particular criticism among the European members of the International. Brandt replies that Poland is not going to be helped with “phrase-mongering” In the interest of peace in Europe, martial law appears to be the lesser evil compared to a feared Soviet intervention in Poland. The letter which Brandt sends to Jaruzelski in early 1982 is also an attempt at a fair balance. Willy Brandt flies on 5 January 1982 to Kuwait for an additional meeting of his North-South Commission. Previously he has spent, accompanied by the SPD politician, Oskar Lafontaine, a Christmas and New Year’s vacation on Cyprus which was peppered with many political appointments. After an evaluation of the Cancún summit, the North-South Commission in Kuwait mainly debates possible measures against the international economic and oil price crisis as well as the rapidly increasing indebtedness of several “Third World” countries. At the same time, Brandt insists that the international community must urgently come to an agreement on an international energy strategy. The members of the Commission decide to once again have their say in a second North-South Report. The new document is scheduled to be ready by late 1982. On account of continuing quarrels in the SPD and increasing tensions with the coalition partner, the FDP, in economic and social policies, Federal Chancellor Helmut Schmidt calls for a vote of confidence in the Bundestag. In the debate before the specific vote takes place on 5 February 1982, opposition leader Helmut Kohl (CDU) criticises the move as a “tactical manoeuvre.” He asserts that Schmidt no longer has a majority in his party for NATO’s dual-track decision. The SPD chairman, Willy Brandt, declares in his speech that the Chancellor has the confidence of his party and his faction and that the SPD wishes to continue the social-liberal coalition. The vote of confidence, so he says, serves the purpose of lending proof to the “government’s complete ability to act.” In the end, all 269 representatives of the SPD and FDP vote for Schmidt. With considerable effort, opponents and supporters of the policies of Federal Chancellor Helmut Schmidt find a compromise formula on NATO’s dual-track decision at the SPD national convention in Munich. According to it, the party will not decide whether it agrees or does not agree to a deployment of US Pershing II and Cruise missiles until the autumn of 1983 in light of the results of negotiations in Geneva on medium-range nuclear weapons. Previously, Willy Brandt already has stated that there would be no automatic reason for a “Yes” if talks in Geneva failed. At his re-election as SPD chairman on 22 April 1982, he receives 388 of 427 votes. Calls by the party convention for more state expenditures, higher taxes and an employment promotion programme provoke the displeasure of the SPD’s coalition partner, the FDP. The Falkland War overshadows the meeting of the “bureau” of the Socialist International (SI). In early April 1982, the group of islands in the South Atlantic belonging to Great Britain are occupied by Argentinian forces. Immediately afterwards, the government of Margret Thatcher sends British troops to retake the Falklands. The conflict, which Willy Brandt characterises as “a bit of the 19th century revival,” ignites a fierce controversy in the SI. The Latin American members in Helsinki put themselves unanimously on the side of the Argentinian military junta. The European parties by contrast demand a condemnation of Argentina as the aggressor, even though they criticise the British reaction as excessive. After the meeting, Brandt goes on a private visit to Norway for a week. The invasion by Israeli troops in civil-war-torn Lebanon on 6 June 1982 and the subsequent siege of Beirut draw sharp criticism all over the world. The Socialist International (SI) also gets involved in efforts to persuade Israel to withdraw. Mário Soares undertakes on its behalf an information-gathering mission to the Middle East. The position which the Portuguese socialist should represent on his mission is given to him by Willy Brandt in a letter dated 21 June 1982. Most of all, Soares is asked to make it clear to the Israelis, that there will be no peace without recognition of the rights of the Palestinians and without the co-operation of the PLO. However, Israel’s government will hear nothing of it: In August 1982, PLO head Arafat and his fighters have to hurriedly leave besieged Beirut. With the volume of memoires, “Links und frei. Mein Weg 1930–1950” (“Left and free. 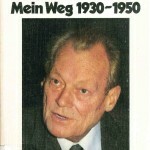 My Path 1930–1950”), Willy Brandt comments at length for the first time in 1982 about his experiences and adventures from the days of his youth in Lübeck and along his Scandinavian exile until his new beginning in post-war Berlin. Centrepiece of the work is his resistance to the NS dictatorial regime in Germany and Europe. With the title, Brandt demonstratively offers a proud commitment to his convictions and his engagement as a young socialist, for which he has repeatedly attracted hostility. On 6 September 1982, the news magazine “Der Spiegel” publishes in advance the first part of a total of five lengthy excerpts of the book which appears in the Publishing Company Hoffmann & Campe and finds a large audience of readers. In 2012, a new edition of “Links und frei” comes out on the market. 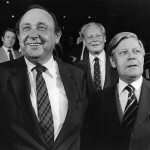 On 17 September 1982, with the resignation of the four federal ministers from the FDP, who thus avert their dismissal by Federal Chancellor Helmut Schmidt, the social-liberal coalition breaks apart after thirteen years. The death blow are the demands of the FDP for deep cuts in the social benefits area which the SPD decisively opposes. In agreement with the Chancellor, the SPD chairman, Willy Brandt, calls in the Bundestag for new elections. The collapse of the coalition in Bonn has strong repercussions for the state parliament elections in Hesse on 26 September. There the FDP fails to surmount the 5% hurdle. At the same time, the SPD and the Greens together are stronger than the CDU. On the evening after the election, with the remark that there is a majority against the Christian democrats, Brandt hints for the first time at the possibility of a red-green coalition. After the collapse of the social-liberal coalition in Bonn, the CDU/CSU and FDP quickly agree on a new governing coalition. By means of a constructive no-confidence vote by the Bundestag on 1 October 1982, they bring down Federal Chancellor Helmut Schmidt (SPD) and elect Helmut Kohl (CDU) as his successor. Hans-Dietrich Genscher (FDP) again becomes Foreign Minister and Vice Chancellor. 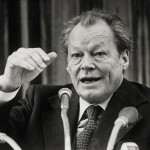 Seven weeks after the change of government in Bonn, the SPD holds a national conference in Kiel under the motto “Departure to the Future.” In a speech to the delegates, the chairman, Willy Brandt, points out that the party will score points in the Bundestag elections planned for March 1983 with its peace policies and a stronger engagement by the state for new jobs and a modernisation of the economy. Hans-Jochen Vogel shall step forward as candidate for Chancellor. Despite the urgent request of the SPD chairman, Helmut Schmidt refuses to run again as the party’s top candidate. The letters which the two former Chancellors exchange in autumn 1982 reveal quite differing viewpoints on the reasons for the loss of power. Brandt emphatically contradicts Schmidt’s complaint about inadequate support. The Brandt Commission suggests immediate emergency measures to prevent, from its viewpoint, the looming collapse of the world economy. It calls for a renunciation of high interest policies and the creation of additional liquidity for developing nations through the IMF and the World Bank. In an assembly with Canadian politicians, Brandt states that he hopes, now as before, for a reform of these international financial institutions.